Click this image to watch the premiere of our official Seven Hour Storm video! Thanks to the good people at PopMatters for premiering our official music video for SEVEN HOUR STORM directed by San Francisco filmmaker Deb Tullmann and starring two of our favorite little friends! Check it out and tell us what you think! Seven Hour Storm is KRCB's CD of the Week! Check out our interview with Brian Griffith and don't forget to grab your FREE DOWNLOAD of our tune Lovers Like Us! Thanks to KRCB, we love you guys! CD of the Week: Misner & Smith's Seven Hour Storm. Download the Free Track, "Lovers Like Us"
"Each song has so many stories behind it, but this is a very special one for both of us. Sam wrote this song after we had a very moving experience playing a house concert for a family that have since become dear friends of ours. We learned a lot from them about how to celebrate life in the face of losing a loved one - how to sing together through that pain. "Next Time Around" is a joyous song, and like most of our songs we tried to fill it with hope. As Sam was first writing it he asked me if I'd like to try singing lead. Singing lead vocals has not really been my focus. As a vocalist I've spent more time practicing and enjoying the craft of harmony singing. From an early age singing songs with my sister in our shared bedroom, then holding down the alto parts in my High school and college choirs, I developed a keen ear and a deep love for singing the 'other' part. But this song was a chance for me to stretch myself and try something new, with Sam's encouragement I gave it a shot. 'So, please don't weep when I've gone, when I've gone ...' "
"Miles Away was the last song to be written for the album, and actually was based on something that I'd written when I was about 18. I rediscovered it on an old cassette tape I'd made back then and decided to try to re-imagine it, keeping a couple of the lyrics, and letting the music spur the new ones. Unexpectedly, as we started recording it some of the lyrics began to embody what we were experiencing in the studio. 'For whatever else we're after/there's no finish line or prize' Trying to trust in the process, and trying to remember that there wasn't a "correct" way to approach the music--we were exploring. The meaning is in the journey. Our graphic designer, Kyle Monhollen (2407 Graphics) responded to one of the lines in the song, too--'There are only two directions/To wither or to grow'--and incorporated it into the album design. As far as the placement at the end of the album, it seemed fitting to end with a song about looking back, reflecting on what came before. Also, in a world of instant gratification it's so easy to forget that meaning can change and deepen over time. 'You may not hear the first time/You have to listen twice'." Direct from Seattle, Washington! Tune in October 25th at 8pm PST for a full concert with Misner & Smith Webcast Live from Empty Sea Studios! Get advanced tickets for the webcast now by clicking below! Thanks to Eric Teel for a great interview and for these photos! Seven Hour Storm is out now! Seven Hour Storm has been officially released and is available everywhere now! Pick yourself up a copy and then head out to one of our upcoming shows so we can personalize it just for you! Seven Hour Storm is officially available TODAY! Celebrate with us, join us for a concert/chat live from our living room today @ 1pm PST! Post comments/questions to our facebook page and chat about the new album! 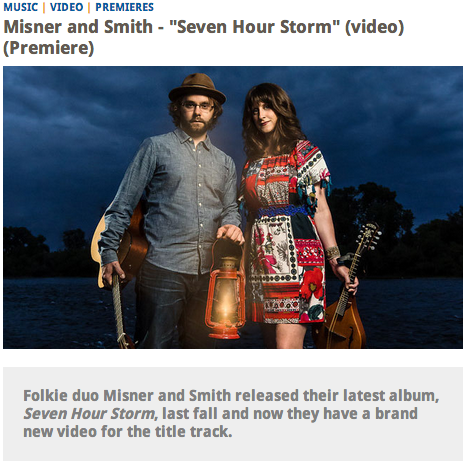 Seven Hour Storm premieres on American Songwriter Magazine! Check it out, share the link, and leave a comment. Let us and the whole world know what you think of the new music! Only 33 days 'til the storm! We're counting down to the official release of Seven Hour Storm on October 15th and things are getting pretty exciting! We've got some great CD release shows scheduled as well as a couple of great tours including dates in Oregon, Washington, and Colorado! Since we began this journey over a year ago we've both learned so much about how the music industry works now and all of the details and moving pieces that go into releasing an album independently. It's probably true that those of you who are close to us have heard us say that we've never worked this hard on anything in our lives. Yup, that's still true! And we're so proud of the results! When we started making this record we knew some about making a studio album but with the support of our fans, friends, and family, we had a budget to really stretch ourselves and experiment during the recording process. We'd never worked with a producer either and we were so lucky to have San Francisco's Jeff Kazor (Richard Buckner, The Crooked Jades), as well as our sound engineer Bruce Kaphan (American Music Club, David Byrne, R.E.M., The Black Crowes). They both approached the project with such creativity and integrity. The result of working with professionals like Jeff and Bruce was that we learned volumes about ourselves, our music, and what we were committing to with this new record. One of the best things about this project has been all of the fine artists we've been able to collaborate with. Coming soon we'll be sharing our very first music video! Deb Tullmann is at the helm on this part of the Seven Hour Storm project. And judging from her formidable talents as an independent filmmaker we're in for a beautiful piece of visual art to pair with the title track of the new record. And we'll also be sharing another video very soon about the making of Seven Hour Storm. This video will chronicle our journey on this album and will include footage from our time in the studio, as well as behind the scenes stories about how it all came together! It's been a year, almost to the day when we launched our fundraising campaign for our new album, Seven Hour Storm. Looking back we both feel so much gratitude to everyone who helped us make this journey. We could not have done it alone and as we are finally able to see the proverbial light at the end of this particular tunnel Seven Hour Storm has become something that is so much bigger than us, and we are so excited to share it with all of you. The Storm is indeed on its way. Well, to sum it up in three words: WE MADE IT!!! Three days after the fundraiser officially ended Misner & Smith headed out on a three-week tour in England, playing several sold out shows around the country with our good friends Breeze & Wilson, and we even made our debut on BBC Radio! Check out a video of the performance here: Misner & Smith on BBC radio. We've booked about 10 days in the studio in January, and we're very excited to get started recording. Conversations with our producer and recording engineer have already begun on how we're going to go about the work--and we can't wait! There's nothing like having a great creative team! We're aiming to release the album sometime in the spring of 2013. It may seem like a long way off, but the truth is, there's a lot of hard work ahead. We want to do this album justice, and to give this collection of songs the attention we believe they deserve. A lot of discovery happens in the studio, and we want to make sure that we honor that process. In this world of instant gratification there is a tendency to rush a final product to press before it's ready. What your support for this album has done--and will do--is allow us the budget to take the time needed to truly make the record we've set out to make from the beginning. And to surprise ourselves along the way. Perks will be sent out/delivered about two weeks before the official release. If handwritten lyrics and/or songbooks were a perk for your contribution, please email us with your choices of songs at info@misnerandsmith.com by November 10th. If we haven't heard from you by then we'll just assume that you want us to surprise you...Those of you who will be hosting house concerts will be contacted individually to discuss details. Thank you in advance for your patience and support as we begin this long process. It's going to be quite a journey, and having each and every one of you in our corner means more to us than we can possibly put into words . We truly couldn't do this without you! If you have any questions you can email us at info@misnerandsmith.com. We'd also like to invite you to join our email list, if you aren't already on it. We send out show announcements and other updates about once a month, and it's the best way to stay up to date with our music and tours. We'll also be posting updates and pictures on our Facebook page, so you can find us there too! Click on the links below to join the fun! Hello dear friends and music lovers! This has already been a very busy and successful summer for Misner & Smith and we're very proud of all that we've accomplished. Now we humbly ask for your help, join us as we take our music to the next level! Our NEW album, 'Seven Hour Storm' is already moving forward! We spent four days of intense work with our producer Jeff Kazor (The Crooked Jades, Richard Buckner) and our sound engineer Bruce Kaphan (David Byrne, R.E.M., The Black Crowes) and completed pre-production for the new album, 'Seven Hour Storm'. The sessions were full of inspiring ideas and plans for the shape and sound of the new music! TODAY we launch our fundraising campaign to raise the money needed to complete this project. It is our most ambitious album yet and we're very excited to share it with you! There are also many perks or 'thank you gifts' available at every level of donation. Every dollar counts and gets us closer to our goal of finishing this album. You can also help us tremendously by spreading the word and sharing this information with your friends and family by email or on social networks like facebook and twitter. We are using the online fundraising platform of Indiegogo.com. This is a secure website that will handle all contributions made to our campaign. Please let us know if you have any questions about Indiegogo or how it all works. When you contribute to this project you become a part of of this album and with the simple act of giving you are directly funding art that you believe in. Join us on this journey and become part of this next chapter for Misner & Smith! How can a 'little' band get bigger? The new album, "Seven Hour Storm" is taking shape already! We've had four days of 'pre-production' sessions with our producer Jeff Kazor, our Sound Engineer Bruce Kaphan, and our full band - Henry Misner (Cloud Season) on electric guitar and Rob Bayne (When the Billionaire Plays Guitar) on drums! We spent four days over two weeks in Bruce Kaphan's studio in beautiful Niles, CA and came away with some gorgeous demos and lots of amazing ideas for the upcoming album, "Seven Hour Storm". The first day consisted of deep discussion about the direction of the new album, we asked lots of questions and brainstormed about how we can broaden the scope of our music for this new offering. We also devoted time to mic testing, choosing the perfect mics to capture the sounds of our vocals and instruments. The results were amazing, on the second day of pre-production we recorded demo versions of the songs that are slated to be on the album as it is now in live takes. 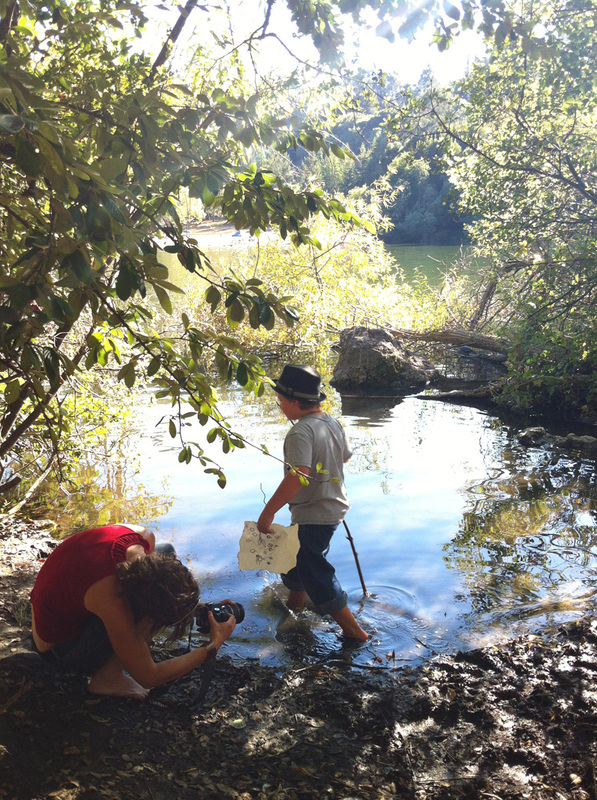 Then we listened back to what we'd been able to capture. The sound is immaculate, a beautiful snap shot of our full sound as the duo. On the third day we had a four hour session with our full band and captured demos for five of the songs that will be on the new album complete with the full band sound. We had a blast playing with Henry and Rob and after the recording was completed we sat down and had some more thrilling discussion about musical possibilities and arrangements for the new album. The ideas were flying and it continued to inspire and inform our direction with the new music. The final day was all about deconstructing the elements of our sound as the duo, defining the key ingredients that make the Misner & Smith sound what it is. We broke down the song "Seven Hour Storm" and recorded it in it's separate parts, vocals and acoustic guitar. Then we started to play around with the arrangement, adding more vocals and playing with the feel and sound of the guitar parts. We walked away from the last day of pre-production with the feeling that the sky's the limit for the sound of this new album. Even the small adjustments we made of adding extra vocals onto the title track, "Seven Hour Storm" made the song open up and the result was inspiring! And after four days of intense work we walked away with a really good feeling about the direction the music is taking us. So, why is it important to us to do this next album in a studio with a producer, a sound engineer, and guest musicians? This is the question we get most about this new album and it's a great one. Over the last eight years we've put out three full-length albums of original music. Halfway Home and Poor Player were both recorded in a studio as live takes, we played the songs live and the sound engineer captured our performances without any "over-dubbing" or adding extra tracks of instruments and vocals. And of course our live album Live at the Freight & Salvage was an amazing experience and captured a truly unique and electric night of live performance in a state-of-the-art acoustic concert hall with a full audience. It also gave us the rare opportunity to pre-release three of the songs that are to be included on our new album to give our audiences a glimpse into the near future of our musical direction. We're very proud of all our albums and all that we've accomplished because of them and now we're ready to try something new! Our imaginations are teeming with more musical ideas than four hands and two voices can produce on their own. The songwriting and specifically the lyrics of our new songs are filled with stories and characters that beg for musical exploration, these new songs are pushing us to dig deeper into our music than ever before. We're looking forward to getting the chance to really flesh out those musical ideas and bring them to fruition with this new album. Now it's nearly time to launch our BIG fundraising campaign to get the funds together to make this album the most ambitious project we've tackled yet! How can a little band get bigger? With tons of exposure and buzz! Indiegogo is the crowd-funding platform that we've chosen to use for our campaign to make our new record. We hope you'll join our team and help us make this recording the best that we can make it not to mention getting it out to the world at large! We'll be launching our fundraising campaign this week and every dollar counts, every friend, family member, and acquaintance you share our campaign with helps us to reach our goal. Be our record company by contributing to "Seven Hour Storm" and be a part of what is to come for Misner & Smith! Here's a little taste of what we accomplished in pre-production . . . enjoy! The NEW ALBUM "Seven Hour Storm"
We can barely contain our excitement as we plan the next steps towards our newest and biggest project yet! Misner & Smith are now embarking on our fourth full length album, Seven Hour Storm. Packed with NEW original music and crafted carefully, we are pulling out all the stops on this project. Over the last eight years, we've completed three albums, Halfway Home (2004), Poor Player (2008), and, Live at the Freight & Salvage (2010). As some of you already know, we began our musical partnership after being cast in a production of the musical, Woody Guthrie's American Song in 2004. That experience became the backdrop of our first notes together. As we sang in harmony during the show we realized our vocal blend was a special one, beyond the everyday, we felt lucky to have found each other and the sound we discovered began to take shape in our own music. But Woody Guthrie's influence is always present in what we strive to accomplish with our own work, songs that tell stories, filled with hope, in universal themes. Now we find ourselves in another production of this same show and filled with all the same inspiration as before. Performing this piece in one of the best acoustic halls in the country, The Freight & Salvage. Working with some of our favorite artists on this show and singing some of the best songs ever written. The cast of Woody Guthrie's American Song 2012 at The Freight & Salvage Coffeehouse in Berkeley, CA. We cannot think of a better time to announce the beginning of our fundraising campaign for our new album. On July 25th we will launch a fundraising campaign to record, mix, master, manufacture, and promote our newest offering, Seven Hour Storm. We will be using crowd funding to raise the funds necessary on the online fundraising platform Indiegogo. The campaign will run just under two months and you can help. This is just a heads up to let you all know about this upcoming opportunity. We are counting on our fans to be our record company. To contribute directly to our music and make this album with us! And we've already begun the recording process! Though this album will be a long term project, due out in early spring of 2013, we are not wasting any time in getting a good start. We will be working with Sound Engineer Bruce Kaphan who has worked with well-known artists such as David Byrne, The Black Crows, Camper Van Beethoven, R.E.M., and Sheryl Crow. And Jeff Kazor, well known for his work with The Crooked Jades, among others will produce the album. We have already had a handful of 'pre-production' sessions in the studio with great success! The idea behind this album is to push ourselves musically and by making an album with more musicians and a producer, etc... we hope to position ourselves for the next stage of our career as Misner & Smith. But never fear, we are all very aware that we want to keep true to the sound that we've developed over the last eight years. Misner & Smith are The Deli's 'Artist of the Month'! June Artist of the Month Sam Misner of Misner & Smith sat down with the Deli to talk about the duo's busy summer touring the U.S. Catch the Americana/Folk revivalists in SF before they're on the road again at The Rockit Room on July 9 with Jonny Cat & the Coo Coo Birds. Deli: How is 2011 shaping up for the band and what can fans expect? We’re really having a great time in 2011 so far—we just got back from two weeks touring in England, did a Pacific Northwest tour before that and will be heading back up there this August. There’s a good chance that we’ll be going down to Austin and the Southwest this fall too. In the meantime we have a couple shows in San Francisco with our full band, which we love to do when we can. Rob Bayne plays drums and Henry Misner plays electric guitar. Most of our shows on the road are just the two of us—though when you travel with an upright bass it’s like having a third person in the band who doesn’t carry anything. We’re planning on working more with the full band this year, and for our next album we’re hoping to fill out the instrumentation more than we’ve done in the past too. We love the idea of having the songs work in both formations, still centered around tight vocal harmonies and lyrics but with some more intricate arrangements. We won’t ever leave the duo thing, though. There’s something really pure about two acoustic instruments and two voices. Deli: Describe the best live gig you ever played and why? The first time we played at the Freight & Salvage in Berkeley a couple years ago was definitely a high point. The venue has such an amazing legacy as an acoustic venue for over 40 years, with many of our heroes on the list of people who have played there. We were honored to play there in the first few months in their new space, which is a beautiful 450 seat theater with great sound. Plus we had decided to record the show for a live album, so there was this undercurrent buzz of excitement that really pushed us to play our best. We released Live at the Freight & Salvage in the Fall of 2010 and have been getting some great feedback about it from both fans and reviewers alike. Deli: Who are your biggest musical influences? Deli: Who are you currently listening to? Dr. Dog. We can’t say enough about those guys. Especially their albums “Fate” and “Shame, Shame”. Really intelligent songwriting and arrangements that are fun at the same time. Everything they do serves the song. And we love what they do with vocal harmonies—it’s complicated stuff but they sure make it sound easy. And the fact that they can pull it all off live is amazing. Deli: If you could make music in another time, when and where would it be and what scene would you join? That’s a tough question because there are so many time periods that had fantastic music and there’s great stuff happening today. Judging from our influences we’d probably have had a lot of fun in the 1960’s and 70’s folk and rock scene. We’d also feel right at home on someone’s front porch in Blue Ridge Mountains in the 1800’s. Deli: What do you love about the Bay Area? It’s one of the most beautiful places in the world, first off. The more we tour and are away from home the more we realize what a special place the Bay Area is to live. Where else can you be so close to mountains, the ocean, the redwoods—the Marin Headlands and up to Point Reyes is an incredible. And then you throw in all creativity that’s going on and supported here, it’s quite a combination. Deli: Favorite venue in the Bay Area? The Freight & Salvage is our favorite venue that we’ve played, although, we also love the vibe at The Independent in San Francisco and we’d love to play their stage with the full band someday. Deli: Can you name a few other local bands you feel particularly close to on an artistic level? The Crooked Jades, Coyote Grace, Misisipi Mike (and all his musical projects), The Magic Leaves, The Stairwell Sisters to name a few. So here we are! We made it over the pond to the old country and we're resting up for a few days with the Beswicks (Megan's Mum's family) before we set out for the midlands and our first three shows on our first UK tour! Five years ago we traveled to England and met Breeze & Wilson at a meeting of the Real Music Club run by Neal Dalton. We've kept in touch since then hoping that we would one day be able to meet up again and share some shows together. Back to present day, we are now back in England for the next two weeks and Breeze & Wilson have been kind enough to organize seven shows for us to play with them during our time here. We will play two House Concerts and the rest of the shows are to be held a Village Halls around the Midlands area. This is our first tour out of the U.S. as Misner & Smith and we couldn't be more excited about being here. No doubt there will be plenty of adventures to be had and stories to tell upon our return. Check back here on our blog for more entries about how the shows are going and what's happening on this tour. Thanks for tuning in! To watch a video of our performance on the Santa Rosa radio station KSRO click HERE.